Myth 1: Rabbits are great, low-maintenance pets. Reality: Although they don’t need to be walked like dogs, rabbits are anything but low-maintenance. Their quarters need daily leaning, and fresh food and water must be offered daily, including a salad of well-washed, dark-green leafy vegetables. Certain rabbit health problems can become chronic and can require regular (and sometimes expensive) veterinary treatment. To complicate the picture, veterinarians skilled in rabbit medicine are often hard to find. Myth 2: Rabbits only live a year or two, so no long commitment is necessary Reality: Well cared-for indoor rabbits can live 7-10 years, and some live into their teens. This is approximately the same life span as some breeds of dogs, and requires the same long-term commitment. Myth 3: Rabbits do not need veterinary care the way dogs and cats do. Reality: Although rabbits in the USA do not require annual vaccinations, nevertheless, regular veterinary checkups help to detect small problems before they become big ones. 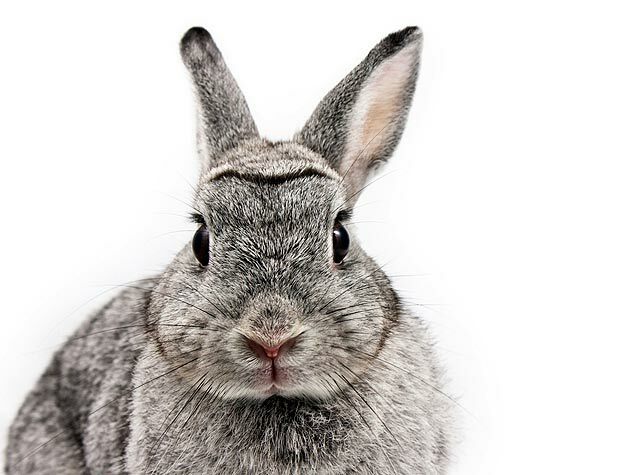 Companion rabbits should be spayed/neutered by veterinarians experienced in rabbit surgery. This not only reduces hormone-driven behaviors such as lunging, mounting, spraying, and boxing, but also protects females from the risk of uterine cancer, the incidence of which can exceed 50% as rabbits grow older. Myth 4: Rabbits are happiest outdoors in a backyard hutch. Reality: Rabbits kept outdoors in hutches are often forgotten and neglected once the novelty wears off. Far too frequently, they are relegated to a life of “solitary confinement” and are subject to extremes of weather, as well as to diseases spread by fleas, ticks, flies, and mosquitoes all of which can adversely affect their health and their life span. They can die of heart attacks from the very approach of a predator – even if the rabbit is not attacked or bitten. Rabbits are gregarious creatures who enjoy social contact with their human care-takers. The easiest way to provide social stimulation for a companion rabbit is to house him indoors, as a member of the family. Myth 5: Rabbits are rather dirty and have a strong odor. Reality: Rabbits are immaculately clean, and, once they have matured and are spayed/neutered, they go to great lengths not to soil their living quarters. They will readily use a litter box and if the box is cleaned or changed daily, there is no offensive odor. Myth 6: Rabbits love to be picked up and cuddled and do not scratch or bite. Reality: Although some rabbits tolerate handling quite well, many do not like to be picked up and carried. If rabbits are mishandled they will learn to nip to protect themselves. If they feel insecure when carried they may scratch to get down. Unspayed/unneutered rabbits often exhibit territorial behavior such as “boxing” or nipping when their territory is “invaded” by the owner. Myth 7: Rabbits -especially dwarf breeds – do not scratch or bite. Reality: Rabbits have powerful hind legs designed for running and jumping. They need living space that will permit them ample freedom of movement even when they are confined. Dwarf rabbits tend to be more active and energetic than some larger breeds, and require relatively more space. Myth 8: Rabbits can be left alone for a day or two when owners travel. Reality: Rabbits need daily monitoring. Problems that are relatively minor in some species (e.g. a day or two of anorexia) may be life-threatening in rabbits, and may require immediate veterinary attention. Myth 9: Rabbits do fine with a bowl of rabbit food and some daily carrots. Reality: The single most important component of a rabbit’s diet is grass hay, which should be provided, free-choice, daily. Rabbit pellets should be given only in very limited quantities.